DPA Microphones launches new d:dicate™ MMP-G MicroDot Preamplifier and GSM4000 Gooseneck Shock Mount to create a wireless solution ideal for live music applications previously thought unachievable for d:dicate™ SDC mic capsules. 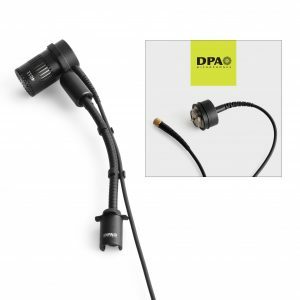 Already a sought after microphone range in the recording industry, DPA Microphones furthers its d:dicate™ Recording Mics series with the introduction of the GSM4000 Gooseneck Shock Mount Accessory and MMP-G Modular Active Cable for MicroDot. These new accessories for the d:dicate™ Microphone Series gives users the ability to create a completely wireless microphone setup, while maintaining extremely high-quality audio during live performances. The MMP-G Modular Active Cable (view product) is an ultra-transparent preamplifier with active drive for impedance balancing to reject frequency interference. It permits the modular d:dicate™ capsules to connect to wireless systems with its fixed MicroDot connector that works with the wide range of DPA adapters suited for all professional wireless systems. The many d:dicate™ capsules, ranging from the legendary omnidirectional 4006 to the 4017 shotgun, can easily be mounted on the MMP-G and present an elegant and discreet solution. The MMP-G is available in two variations, MMP-GR with the cable extending from the rear or MMP-GS, with the cable extending from the side. The GSM4000 Gooseneck Shock Mount Accessory has an elegant clip at the end where the d:dicate™ capsule can easily be mounted with a preamp connected to it. Depending on the situation, the user is able to use the new MMP-G Modular Active Cable for wireless or the MMP-E Modular Active Cable for wired solutions. The GSM4000 has an integrated shock mount solution ensuring the perfect sound is not affected by, for example, handling noise. The GSM4000 is available in black, has a length of 11.5 cm (4.5 in) and allows the microphone to be set up in a variety of different positions. The GSM4000 has the same diameter as the already renowned d:vote™ 4099 Instrument Microphones gooseneck. This means that the d:dicate™ solution can be used with the instrument mounts and clips that have gained success with musicians, who mount the mic on their instrument so that they can enjoy the freedom of movement while playing. Traditionally, musicians and sound engineers bought the legendary d:dicate™ microphones like the d:dicate™ 4006A Omnidirectional Microphone or the d:dicate™ 4011A Cardioid Microphone because they wanted the highest-end recording microphones available on the market. Now these new accessories give them wireless freedom. The mics can easily be used on several instruments – and taken on the road with no issues. No other microphone brands have wireless microphones with sound quality and specifications as high as the d:dicate™ series, so this is a completely unique solution on the market. With our wide range of mic capsules, goosenecks and instrument mounts and clips, all musicians – from classical piano players to rock drummers, can choose precisely the solution that best meets their needs. The flexible d:dicate™ Microphone Series incorporates modular capsules acclaimed for their exceptional linear frequency responses, high SPL and superior gain before feedback. These high-quality mics provide accurate, colorless sound and are perfect for close-miking situations. With several modular preamplifier solutions to connect to, there is a microphone configuration for all needs. The new GSM4000 Gooseneck Shock Mount and MMP-G Preamplifier will be available in Summer 2016. Please get in touch for more information and to find a dealer near you. The DPA d:vote™ VO4-Classic and -Rock kits have been paired with d:dicate™ 2011C mics and the brand new 4011GS mics to create two powerful kits, each including 4 x 4099 mics, a host of d:vote™ clips and either 2 x d:dicate™ 2011C or 4011GS (with GSM4000) microphones. The DPA VO4 + 2011 Live Mic Kit combines the versatility of their brilliant d:vote™ Instrument mics with a pair of the unbeatable d:dicate 2011C cardioid condenser mics. This July, get 15% Off the list price, a saving of £360. The DPA VO4 + 4011G Live Mic Kit features a pair of the brand new d:dicate™ 4011G recording mics with GSM4000 gooseneck shock mounts for instrument mounting with d:vote™ clips. This July, save over 10% off the list price, a huge saving of £380.